How accurate are DNA Panels? ADOPTABLE DOGS! We believe that our dogs are our best friends, and that’s why we need a reliable source to turn to for information on all things “dog” in our community. 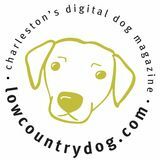 Our mission is to be the number one Charleston area resource for dog owners regarding regional dog-centric and dogwelcoming events, health & wellness information, dog training, trends, and local news. We also strive to be a mouthpiece to the public for various Lowcountry-based pet non-profits, and we promote pet adoption and other responsible pet care practices. Founded in Charleston, South Carolina in 2005 as a print magazine, we re-launched in 2015 as an online publication. In 2016 we updated our website to continue our mission to be the best dog friendly resource in the Lowcountry. Nutrients Your Dog Needs There are the six essential classes of nutrients dogs need for optimum healthy living. Water Essential to life, water accounts for between 60 to 70% of an adult petâ&#x20AC;&#x2122;s body weight. While food may help meet some of your pet's water needs (dry food has up to 10% moisture, while canned food has up to 78% moisture), pets must have fresh clean water available to them at all times. A deficiency of water may have serious repercussions for pets. A 10% decrease in body water can cause serious illness, while a 15% loss can result in death. Proteins Proteins are the basic building blocks for cells, tissues, organs, enzymes, hormones and antibodies, and are essential for growth, maintenance, reproduction and repair. Proteins can be obtained from a number of sources including animal-based meats such as chicken, lamb, turkey, beef, fish and eggs (which have complete amino acid profiles) and in vegetables, cereals and soy (but these are considered incomplete proteins). your dog matures. Commands taught to your dog during obedience training can be used to help control and manage your dog. Doing so allows you to prevent and eliminate unacceptable behaviors. Effective lines of communication along with consistency promote respect and understanding. Understanding aids in developing a healthy, happy relationship between us and our canine partners. So remember, never sometimes and obedience is much more than sit, stay, and come. CANINE PODIATRY Written by Stacy Jesson Have you ever noticed the sound of your dog’s nails tapping on the floor as they walk through the house? Would you be surprised to know that this sound is a sign of inflammation in your dog’s body? Long toenails push your dog's posture back which in turn pushes every joint from toes to tail out of alignment. Joint misalignment creates stress and inflammation in our dog’s entire body. If we can prevent stress in our dog’s body, we can increase the length and quality of their lives! This is the letter I wrote to Murray, a dog we had to put down due to aggression. Although it was one of the hardest things we had to do, I know for a fact it was the right thing. My goal by sharing this with all of you, is that I hope if you ever run into this decision – do not feel like a failure. You are NOT the one that harmed them to make them behave this way, you are the one that showed them love. You are the only one to show them love. 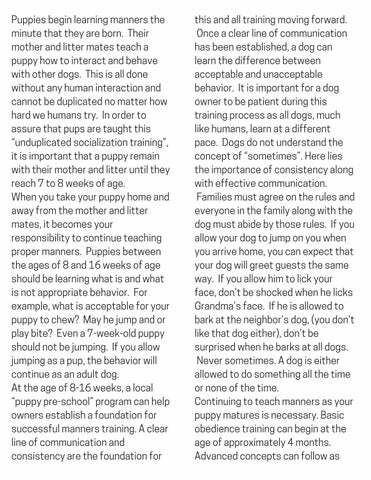 I’m not saying give up on any dog that has one incident, but I am saying that if it no longer feels safe, it may need to be time to make the most unfortunate decision. Make their last few days extra special. Make them feel worthy. Be there with them as they cross over. Sometimes it might seem “better” to surrender them to a rescue or shelter. I promise you, it isn’t. Most shelters and rescues do not have the resources to rehabilitate to that extent and will most likely euthanize anyway. So, if you’re going to do it – be there. It hurts, but be there. Let them leave the Earth feeling wanted and loved – it’s what they deserve. 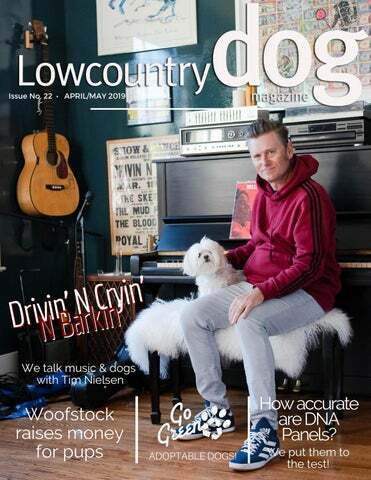 About the Cover Tim Nielsen, bassist for the band Drivin' N Cryin' has called the Lowcountry his home since 2011. He shares his home with his dog Bailey, whose favorite activity is to ride in the golf cart to Pitt Street Bridge. 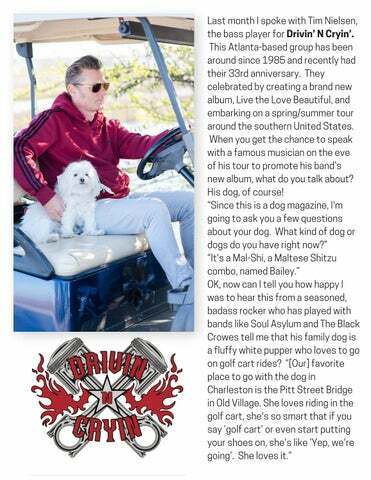 We discuss all things dog and rock n roll with this rock legend who has been rockin with his band for over 33 years. Bailey lives by the song, " A toy never played with is not a toy at all, a day never lived in is not a day at all!" â&#x20AC;&#x153;She's the best dog. I mean, I've had big dogs, German Shepherds, Golden Retrievers and stuff and Bailey's my favorite.â&#x20AC;? literally ANY post] but it also makes it way easier for musicians to get their music heard. “That's definitely a great advantage. It’s very simple and we have a distribution deal, so distribution means it's going to be out digitally in every format and then the records are going to get to the record store and Amazon, Barnes & Noble and Wal-Mart, whatever.” It seems like life has been pretty good to Tim. He is a founding member of a successful band that has put out multiple albums, several of which have been in the top US Chart positions and in 2015 was inducted into the Georgia Music Hall of Fame. I’m always curious, though, about what people would have done if they hadn’t taken a certain path. If you weren’t a musician, what would you be doing? “I’m a pretty good carpenter and I’ve been a craftsman and contractor in the past and I still do a little bit of carpentry. I enjoy doing that, working with my hands, but, you know, I might be a fishing charter guy…we have some fans of ours that are fishing charter captains and we get to go out with them all the time.” If Tim ever decides on a career change, I can guarantee the line to book his fishing charters would be out the door. Cruising around the Charleston waterways, drinking a beer with a rock legend while he tells you stories about his life and takes you to the best fishing spots…to many fans, it couldn’t get better than that. We also talked about things we would tell our younger selves. “Just be thoughtful and courteous, my younger self was probably a bit high strung and crazy, like most people.” I told Tim that I wish I could tell 20 year old Julie to relax and not worry so much about everything and everyone and he agreed, that would be good advice. “Yeah, absolutely, relax! 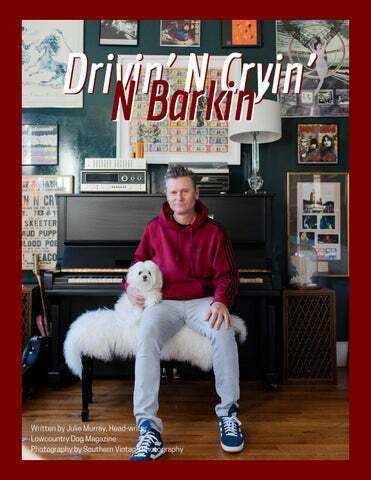 Life is gonna get stressful enough so just enjoy being young.” Drivin’ N’ Cryin’ is currently on tour and Tim will return to the Lowcountry for their May 24th show at the Windjammer on Isle of Palms. You can purchase tickets on their website, https://www.drivinncryin.com/, and also be sure to check out their new album when it rolls out on June 21, 2019. And if you’re ever in Old Village, keep an eye out for a sweet little white dog, riding on a golf cart with her fur blowing in the wind and a big smile on her face. others in the database, these companies can give you an idea of what breeds your dog is mixed with. Many DNA panels can give you percentages of each breed that they have found in your dog’s DNA so not only can you find out what your dog is mixed with but also what percentage of their genetic makeup each breed contributes. The test results are usually emailed back to you within 2-8 weeks. When DNA panels hit the market in 2007 they were met with both curiosity and skepticism. How accurate can these DNA panels be? Which DNA test has the best results? Nathan Sutter, PhD, assistant professor of medical genetics at Cornell University says “The more breeds in a company’s database, the greater the chance for accuracy in their results.” This allows the database to compare against more breeds to have more accurate findings. Unfortunately, companies with more breeds in their DNA base often are more expensive than others. 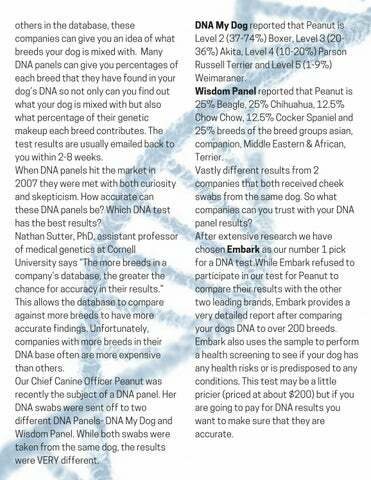 Our Chief Canine Officer Peanut was recently the subject of a DNA panel. Her DNA swabs were sent off to two different DNA Panels- DNA My Dog and Wisdom Panel. While both swabs were taken from the same dog, the results were VERY different. DNA My Dog reported that Peanut is Level 2 (37-74%) Boxer, Level 3 (2036%) Akita, Level 4 (10-20%) Parson Russell Terrier and Level 5 (1-9%) Weimaraner. Wisdom Panel reported that Peanut is 25% Beagle, 25% Chihuahua, 12.5% Chow Chow, 12.5% Cocker Spaniel and 25% breeds of the breed groups asian, companion, Middle Eastern & African, Terrier. Vastly different results from 2 companies that both received cheek swabs from the same dog. So what companies can you trust with your DNA panel results? After extensive research we have chosen Embark as our number 1 pick for a DNA test.While Embark refused to participate in our test for Peanut to compare their results with the other two leading brands, Embark provides a very detailed report after comparing your dogs DNA to over 200 breeds. Embark also uses the sample to perform a health screening to see if your dog has any health risks or is predisposed to any conditions. This test may be a little pricier (priced at about $200) but if you are going to pay for DNA results you want to make sure that they are accurate. Second on our list is Wisdom Panel, one of the DNA tests taken by Peanut. Wisdom Panel is great for dogs who are mixed with many other breeds because they have over 250 breeds in their database to analyze with, although their reports and not as detailed as Embark. They also perform a health screening just like our number 1 pick. Wisdom Panel gave accurate results for Peanut when tested against another nonreputable DNA company. This is also a good option for those with a tighter budget when it comes to DNA testing (priced at about $75). HomeDNA Orivet Dog DNA Test and Life Plan rounds out our top 3 DNA panels. They offer 2 DNA panels, one for breed identification and one for health screening. Each of the DNA tests come with a life plan, which includes everything from diet, exercise routine and playtime routine based upon the breeds that are included in the results. These tests are priced at about $120 per test but are thorough and great for first time dog owners who aren’t sure exactly what they should be doing to care for their specific dog. 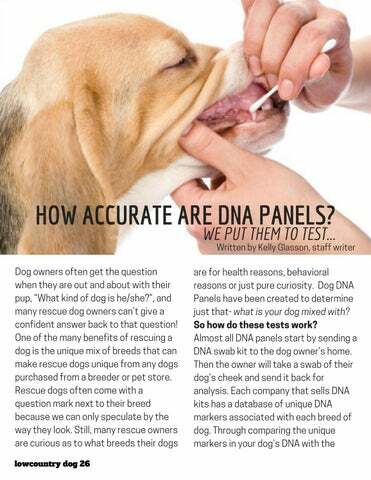 DNA Panels can be very informative and help to find useful information about our furry friends. Like all things having to do with our pets, doing thorough research on the best option for them is the best way to determine which DNA panel can help determine their doggy history. may make it impossible for them to take on another responsibility.” This often leads to the pet being taken to a shelter, scared and wondering where their “person” has gone. Other life events, such as hospitalization, divorce, or moving to assisted living or hospice may also lead someone to give up their animal. When this happens, Dr. Lanford says the people are often devastated, worried, and unable to rest or heal while worrying about the welfare of their pet. After seeing this happen many times throughout her career, Dr. Lanford came up with the idea for a place where animals can go when their people can no longer care for them. “[It’s] a home, a real home, with couches and beds and cat trees and a fenced yard. A place where owners can visit if they like or, if their health does not allow, we can take the pet to them for visitation as long as possible.” That way, the animal is still loved and cared for, and the owner knows that their pet is safe and will have a place to be for the rest of its life. Dr. Lanford told me that her favorite thing to witness is the human/animal bond and how strong and amazing it is. “My favorite part of what we do is taking animals to see their owners in hospice. They bring such comfort to each other and often after that last visit, the owner is able to pass peacefully, knowing their beloved companion will be OK.” Not only does Happy’s Porch provide peace of mind and security, they also fill a great need in the rescue community. “Through the years we have pulled over 250 critically ill animals and made them whole. Seeing them move on to their forever homes is absolutely breathtaking!” Dr. Lanford said she learned so much about this special bonding that occurs from the organization’s namesake, Happy the Golden Retriever. 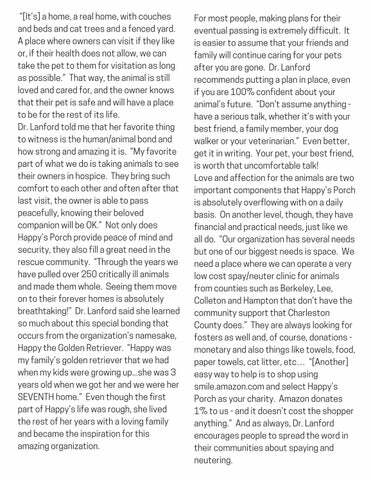 “Happy was my family’s golden retriever that we had when my kids were growing up...she was 3 years old when we got her and we were her SEVENTH home.” Even though the first part of Happy’s life was rough, she lived the rest of her years with a loving family and became the inspiration for this amazing organization. For most people, making plans for their eventual passing is extremely difficult. It is easier to assume that your friends and family will continue caring for your pets after you are gone. Dr. Lanford recommends putting a plan in place, even if you are 100% confident about your animal’s future. “Don’t assume anything have a serious talk, whether it’s with your best friend, a family member, your dog walker or your veterinarian.” Even better, get it in writing. Your pet, your best friend, is worth that uncomfortable talk! Love and affection for the animals are two important components that Happy’s Porch is absolutely overflowing with on a daily basis. On another level, though, they have financial and practical needs, just like we all do. “Our organization has several needs but one of our biggest needs is space. We need a place where we can operate a very low cost spay/neuter clinic for animals from counties such as Berkeley, Lee, Colleton and Hampton that don’t have the community support that Charleston County does.” They are always looking for fosters as well and, of course, donations monetary and also things like towels, food, paper towels, cat litter, etc… “[Another] easy way to help is to shop using smile.amazon.com and select Happy’s Porch as your charity. Amazon donates 1% to us - and it doesn’t cost the shopper anything.” And as always, Dr. Lanford encourages people to spread the word in their communities about spaying and neutering. Does Your Dog Have Manners? What does it mean to have manners? For humans, it means to have polite social behavior toward others. Humans are taught manners and what it means to have good manners at a very young age. Having good manners is important for success in society. 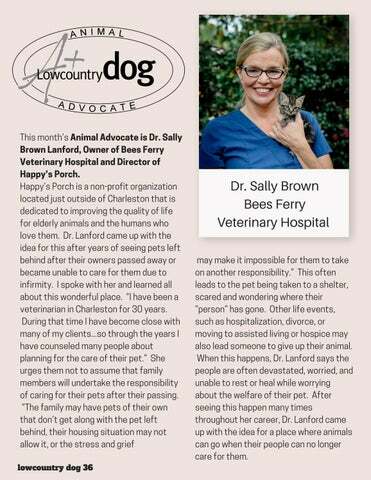 This issue we highlight Dr Sally Brown from Bees Ferry Veterinary Hospital whose started Happy's Porch. How Accurate Are DNA Panels? Our Chief Canine Officer, Peanut, put leading brands to the test. The results may shock you. Written by Stacy Jesson of Crescent Moon Healing Have you ever noticed the sound of your dog’s nails tapping on the floor as they walk through the house? Would you be surprised to know that this sound is a sign of inflammation in your dog’s body? 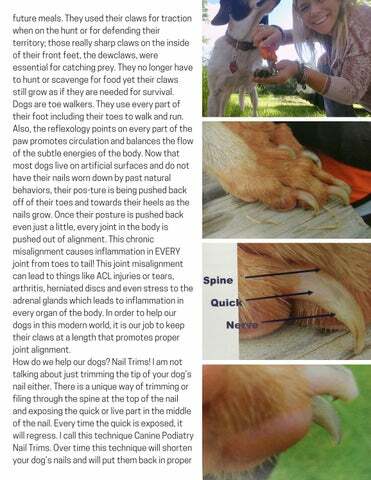 Long toenails push your dog's posture back which in turn pushes every joint from toes to tail out of alignment. 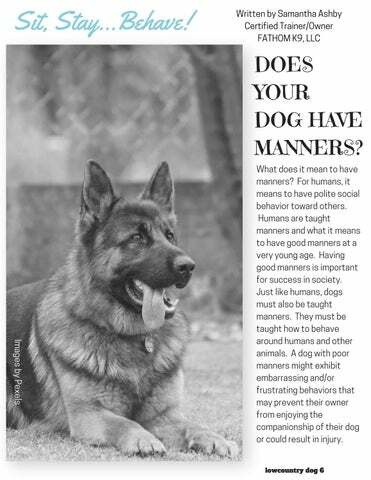 Written by Samantha Ashby of Fathom K9 What does it mean to have manners? For humans, it means to have polite social behavior toward others. Humans are taught manners and what it means to have good manners at a very young age. Having good manners is important for success in society.